Stalin's march toward a more modern USSR flooded a monastery, leaving a unique and extravagant nautical marker, "The Flooded Belfry." 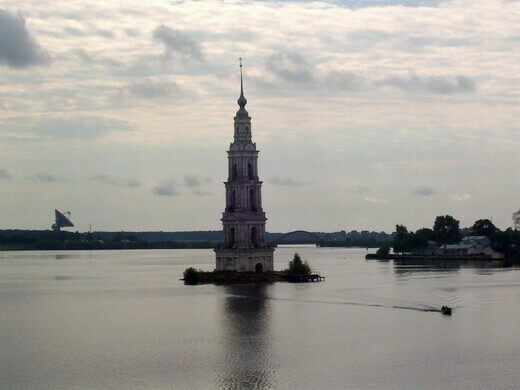 Since 1939 a flooded bell tower near the small Russian town of Kalyazin has played the role of nautical marker, man made island in a man made lake, swim spot and tourist draw. While still a solid structure visited by tourists, and occasionally host to Orthodox Christian ceremonies, the tower is the last remnant of a monastery hundreds of years old, abruptly erased by the rise of Josef Stalin’s USSR. 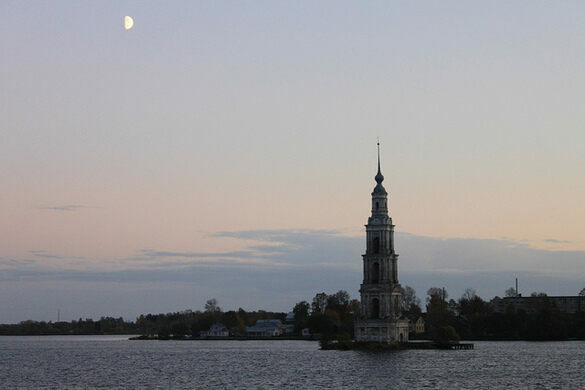 Underneath the waters of the Uglich Reservoir lie two monasteries, built in the 15th and 16th centuries. When Stalin moved to modernize the USSR in the late 1930s, a dam was built on the Upper Volga River, flooding an area roughly 249 kM². With an average depth of 5 m and as deep as 23 m in some spots, most of the buildings and structures were destroyed or covered by the waters. However, one section of the St. Nicholas Cathedral rose above the man made lake - its bell tower. The inside of the tower is bare, as things inside the structures were removed before the water rose, but it still draws tourists for a peek inside the peak. There’s a small boat dock outside, and it’s a spot for swimmers to head out to from the shore. While originally just a tower, it has been filled in a bit and strengthened to give it more of an island stance. The town is now also home to a radio telescope, creating an interesting juxtaposition of modern science with medieval religion. A Marxist summer camp full of fantastical statues lies tucked away and forgotten in the forests of Moscow.